BART, The Dramatic History of the Bay Area Rapid Transit System presented by Michael C. Healy, BART Historian. 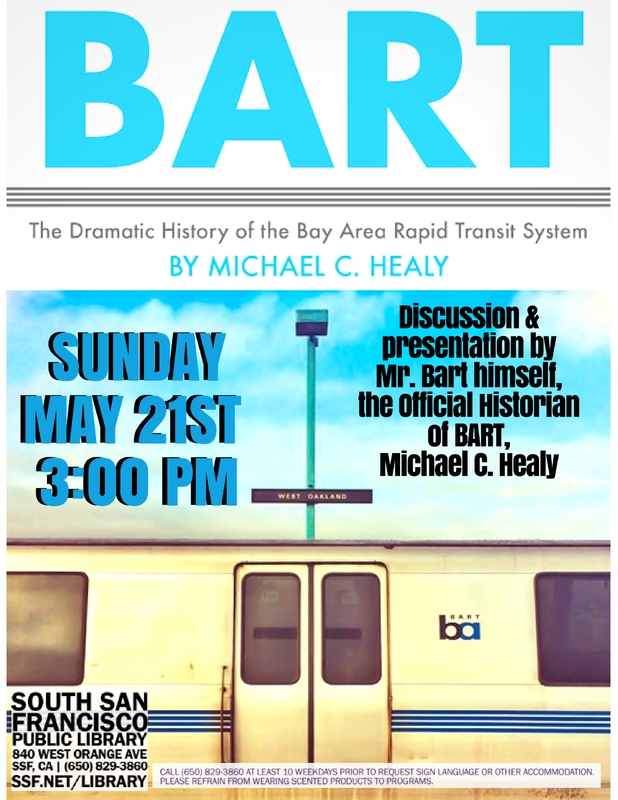 The discussion will be led by Mr. Bart himself the Official Historian, Michael C. Healy, author of the book, BART: The Dramatic History of the Bay Area Rapid Transit System. This fascinating book undertakes the massive task of chronicling something the Bay Area takes for granted. Did you know that the original BART plan included Marin and San Mateo counties? Healy does a terrific job exploring both the grand plans and the hard realities of building one of the nation’s first multi-county rapid transit systems. Nicknamed “Mr. BART” by his colleagues, Michael C. Healy was responsible for BART’s media affairs and marketing activities from 1971—about ten months before trains started running—until his retirement in 2004. He wrote for radio and film and was the editor of the Sausalito News before taking a public relations job at the nascent transit agency. He is an alumnus of the University of Southern California.